Provides an in-memory storage with Least Frequently Used (LFU) replacement policy. The frequency right now is usage count. Definition at line 39 of file in-memory-storage-lfu.hpp. Definition at line 26 of file in-memory-storage-lfu.cpp. Definition at line 31 of file in-memory-storage-lfu.cpp. Update the entry when the entry is returned by the find() function, increment the frequency according to LFU. 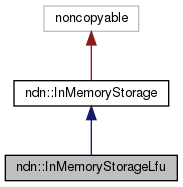 Definition at line 68 of file in-memory-storage-lfu.cpp. Definition at line 37 of file in-memory-storage-lfu.cpp. Definition at line 60 of file in-memory-storage-lfu.cpp. Definition at line 54 of file in-memory-storage-lfu.hpp.